We have applied the State Tax Analysis Modeling Program — known as STAMP® — to estimate the costs and economic effects of Michigan’s 2008 state RES mandate and the proposed “Michigan Energy, Michigan Jobs” ballot proposal. STAMP® is a comprehensive computer model that captures the detailed impact of tax and regulatory policy changes on a state’s economy. [*] To analyze this RES policy, the net percentage change in electricity was calculated and its effects were determined based on elasticities of economic variables with respect to changes in utility costs. [†] The modeling results appear below. In light of the wide divergence in the costs and capacity factor estimates available for the different electricity generation technologies, we provide three estimates of the effects of Michigan’s RES mandate, using low, medium and high cost estimates of both renewable and conventional generation technologies. Each estimate represents the change that will take place in the indicated variable against the absence of the RES mandate. The Appendix details our methodology. Graphic 1 shows the estimated costs and economic impact of the current 10 percent RES mandate in 2015, compared to a baseline of no RES policy. Our results are a comparison between the projected economic activity with the RES in 2015 and the projected economic activity without it. The STAMP model simulation indicates that upon full implementation, the RES law will harm Michigan’s economy. The state’s ratepayers will face higher electricity prices, which will increase their cost of living and put downward pressure on households’ disposable income. In 2015, Michigan’s economy will have 7,220 fewer jobs, within a range of 6,430 to 7,870 lost jobs. The job losses due to the RES will reduce real incomes. The price increases will have a similar effect, as firms, households and governments spend more of their budgets on electricity and less on other items, such as home goods and services. In 2015, the RES will reduce real disposable income by $600 million, within a range of $540 million to $660 million. Furthermore, net investment will fall by $83 million, within a range of $74 million to $91 million. Note: Costs are calculated in comparison to a baseline projection of Michigan’s economy absent the 10 percent RES. 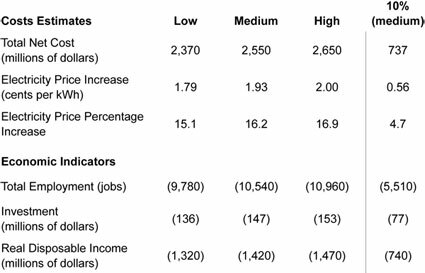 We used the same methodology to study the 25 percent RES mandate by the proposed “Michigan Energy, Michigan Jobs” ballot measure against a baseline of no RES requirement. Graphic 2 displays the results in 2025.
in the state would dampen the economy. In 2025, the 25 percent RES would impose costs of $2.55 billion, within a low estimate of $2.37 billion and a high estimate of $2.65 billion. The far right column in Graphic 2 shows the projected results of the current 10 percent mandate in 2025. The effect is substantially lower than under the ballot measure. Furthermore, the effect is lower than it is for the 10 percent mandate in 2015 (see Graphic 1 above). This occurs because the cost of renewable energy is expected to decrease relative to conventional energy over time and because Michigan is expected to generate a higher percentage of electricity from renewable sources in 2025 under the baseline scenario than it will in 2015. These electricity price increases are more than triple the increases for Michigan’s current RES. In 2025 under the medium cost scenario, the 25 percent mandate would increase electricity prices by 1.93 cents per kWh, compared to only 0.56 cents per kWh under the 10 percent mandate. The higher costs would lead to more economic damage. 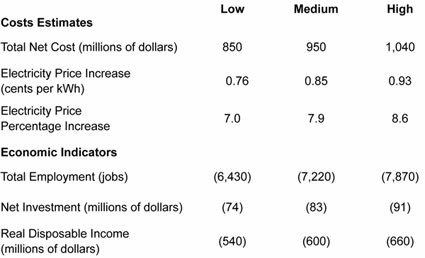 The higher proposed mandate would cost Michigan’s economy 10,540 jobs in 2025, within a range of 9,780 to 10,960 job losses. The higher mandate would leave individuals with less disposable income to spend on home goods and services. In 2025, real disposable income would be an estimated $1.42 billion less, within a range of $1.32 billion to $1.47 billion. The proposed 25 percent RES would bring some new investment, such as infrastructure upgrades and green energy projects, but net investment — which would include lost investment due to higher electricity costs and a slower economy — would fall by $147 million, within a range of $136 million and $153 million. This projected net loss in investment may seem counterintuitive, given the emphasis that the proposal’s supporters place on jobs and investment. The investment in new renewable power sources, transmission lines and reconfigurations of the electricity grid would supplant investment in relatively affordable and efficient electricity production from traditional sources. 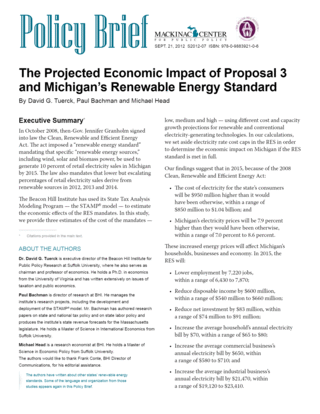 Note: Costs are calculated in comparison to a baseline projection of Michigan’s economy absent both the 25 percent and 10 percent renewable energy standards. Graphic 3 shows how the two different RES mandates would affect the annual electricity bills of households and businesses in Michigan absent any cost caps. In 2015, the higher electric bills required to meet the existing 10 percent RES are projected to cost average households an extra $70 per year; commercial businesses, $650 per year; and industrial businesses, $21,470 per year. In 2025, the higher electric costs required to meet the 25 percent RES mandate are projected to cost average households an extra $180; commercial businesses, $1,630; and industrial businesses, $53,580. The electricity cost hikes for residential, commercial and industrial ratepayers necessary to meet the existing 10 percent RES appear to exceed the retail cost caps written into the Clean, Renewable, and Efficient Energy Act. If the projected cost of the 10 percent RES were passed onto consumers in 2015 under the provisions of the cost cap, the residential, commercial and industrial ratepayer price hikes would be roughly double, triple and ten times the cost cap stated in the law. 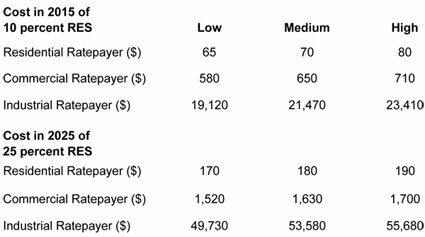 [¶] It is worth noting that electrical producers appear to be charging the legal maximum under the cost cap to many of their consumers. It is not obvious, however, that the cost caps would prevent Michigan’s economy from suffering most or all of the full economic impact of the RES as summarized in Graphic 1, Graphic 2 and Graphic 3. Some costs of complying with these renewable energy standards may be recoverable from consumers in other parts of their electric bills, since the list of “recoverable charges” utilities may legally pass on is not limited to renewable energy compliance costs alone. In addition, renewable energy sources receive both state and federal subsidies. These subsidies lower the cost of renewable energy to electricity producers, and they therefore lower the costs that utilities may charge consumers. This fact does not mean that ratepayers have escaped the economic costs of complying with the renewable energy mandates, however. The money they may have saved as electric consumers may instead be taken from them via taxes they pay directly or indirectly to support the government subsidy programs. Of course, in the case of federal subsidies, Michigan ratepayers may not bear all of the costs, but they inevitably bear some of those costs as federal taxpayers. Moreover, for a variety of reasons, utilities may choose to bear some of the RES costs that they cannot pass onto consumers without exceeding the cap. While this may spare consumers some of the rate hikes they might otherwise experience, the loss in the utilities’ cash reserves and profitability can cause economic damage in other ways. Alternatively, the utilities might be granted the ability to extend these charges for many years to come, allowing them to recover costs over time that they cannot charge now and in the immediate future. [*] Detailed information about the STAMP® model is located at http://goo.gl/3TCj3. In brief, however, STAMP® is a “computable generalized equilibrium model.” A CGE model is ‘computable’ in the sense that it requires the solution of a system of nonlinear simultaneous equations for each policy simulation. It is ‘general’ because it allows for the interdependence and interaction of all markets, their prices and their quantities. It is in “equilibrium” because supply is assumed to equal demand in each market. [†] See Appendix for details. [‡] Based on a projected price of 10.78 cents per kWh for 2015 using a price of 10.37 cents per kWh for 2011 (for the latter, see “Electric Power Monthly: January 2012,” (U.S. Energy Information Administration, 2012), 118, Table 5.6.B. Average Retail Price of Electricity to Ultimate Customers by End-Use Sector, by State, Year-to-Date, http://www.eia.gov/electricity/monthly/current_year/ January2012.pdf (accessed Sept. 11, 2012)). [§] Based on a projected price of 11.88 cents per kWh for 2025 using a price of 10.37 cents per kWh for 2011 (for the latter, see “Electric Power Monthly: January 2012,” (U.S. Energy Information Administration, 2012), 118, Table 5.6.B. Average Retail Price of Electricity to Ultimate Customers by End-Use Sector, by State, Year-to-Date, http://www.eia.gov/electricity/monthly/current_year/ January2012.pdf (accessed Sept. 11, 2012)). [¶] For instance, the $70 annual medium-cost scenario for a residential ratepayer amounts to approximately $6 per month, which is double the $3 per month maximum permitted under the cost cap in the law. See the “retail rate impact” limits in MCL § 460.1045(2)(a)-(c). [**] The 16.2 percent medium-cost scenario is equivalent to a 1.16 percent compounded annual increase from 2012 through 2025.